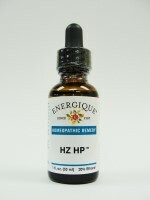 HZ HP - 1 oz. For temporary relief of symptoms due to virus-associated rashes and cold sores. Lycopodium clavatum 30X, Mezereum 30X, Natrum muriaticum 30X, Nitricum acidum 30X, Ranunculus bulbosus 30X, Rhus toxicodendron 30X, Sepia Succus 30X, Thuja occidentalis 30X.